Tunic by FADENMEISTER BERLIN with short sleeves. 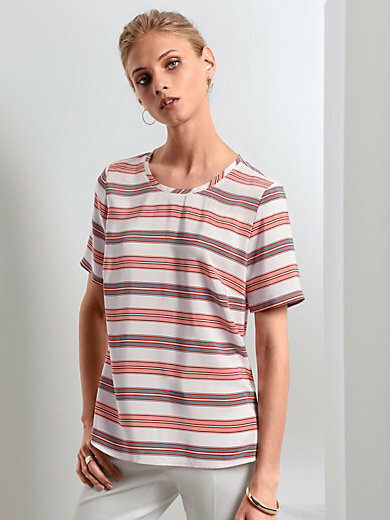 Lightweight summer tunic made of soft, washed crêpe de Chine with chic stripes. Elegantly flowing, in a loose fit. Casual, easy to slip into style with a small vent with button fastening at the back of the round neckline, a slightly longer back and small side vents. 100% silk. Length approx. 26ins. The tunic is machine washable.